When the time comes and you are looking for Wedding Anniversary gift ideas - often you are not quite sure what to send. Couples have obviously been married a number of years, you are looking for a gift for the couple and you want something for both of them to enjoy. It's true to say that flowers - a gift of a flower arangement or anniversary bouquet, chocolates, fruit, anniversary balloons, or a plant is a very popular and thoughtful Wedding Anniversary present. We can make any of our flower bouquets or arrangements in colours to suit your anniversary year and make your gift more personal and unique. We have done Rich red arrangements to celebrate a Ruby Wedding Anniversary for their 40th anniversary, Silver touches for a 25th Wedding Anniversary party, and can add pretty pearl touches for 30th Pearl Wedding Anniversaries. 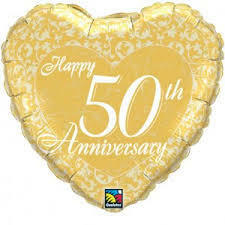 Or popular Golden Wedding Anniversary Celebration Bowl is a lovely gift to send - A table arrangement for them to help celebrate their Special 50th Wedding Anniversary. We even had a call the other day for a unique 70th Wedding Anniversary present - that's the first time we have made one of those. 70 Years! So, put your thinking cap on, and give us a challenge to come up with a great gift idea for your special wedding anniversary celebration. We'd love to help!